An important technique that jazz musicians use to create harmonic movement is tritone substitution. This technique can add some great color to your jazz solos. In this lesson, I’m going to talk about tritone substitution, what it is, and 3 different types you should be aware of. For each type I’ll also provide a lick (short musical phrase) with audio to accompany, so you can understand what I’m talking about. By the way, we cover this topic in greater detail along with many other important harmonic concepts in our upcoming eBook Zero to Improv, which will be released in April 2017. 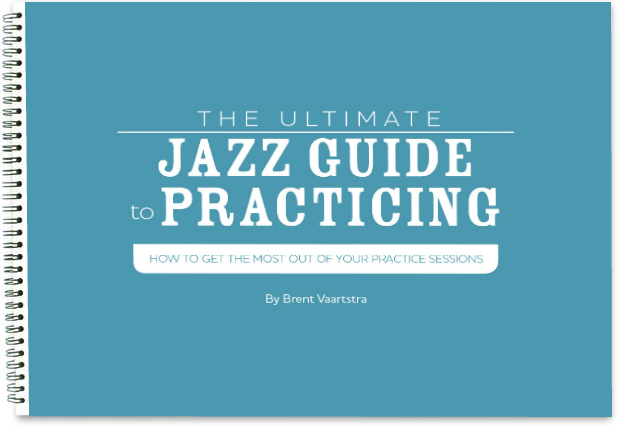 It’s a book that teaches you how to become a great jazz improviser from the ground up. 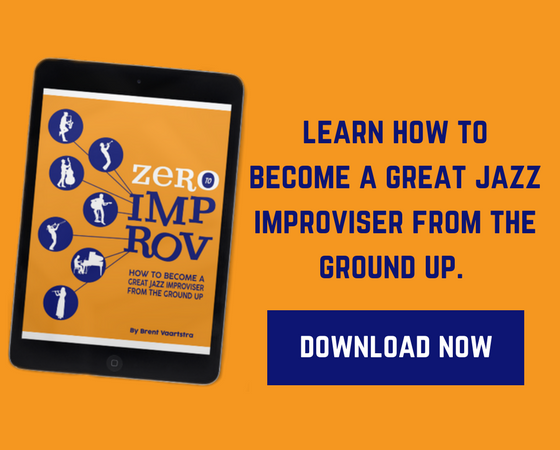 If you like this lesson, sign up for our newsletter so you can get notified when Zero to Improv is released! First things first, let’s get some definitions out of the way. A tritone is an interval of three whole tones (tri) between two notes. You can also think of it as a #4 or b5 from a root note. Gb (or F#) is a tritone away from C and C is a tritone away from Gb. 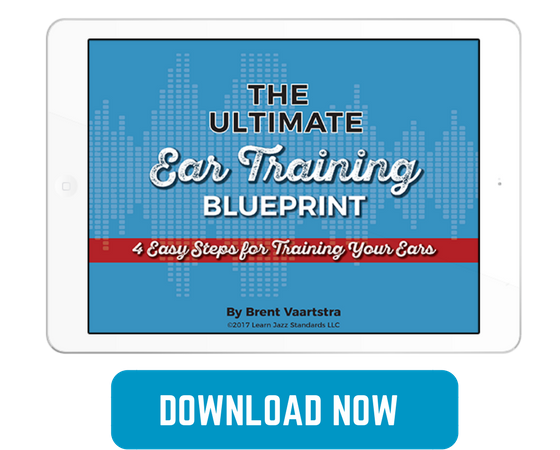 You want to be able to identify tritones on a whim, as well as any other intervals that exist. Go ahead and test yourself. Pick a note and define what the tritone interval is. Go through a bunch of them to make sure you have the concept down. When you understand what a tritone interval is, understanding a tritone substitution is fairly easy. A tritone substitution occurs whenever a chord is being substituted or replaced by another chord with a root a tritone interval away. Example: G7 is replaced by Db7. In practice, a tritone sub in jazz is most commonly a dominant 7 chord. This doesn’t mean you can’t substitute other chord qualities, but a dominant 7 is most often the chord being used to replace. So let’s jump right into some different kinds of tritone substitutions. This is by far the most common tritone substitution, so pay close attention. This often occurs in a ii-V-I progression, and the V is being substituted by the adjacent tritone dominant. Right off the bat, you can conclude that by substituting a Db7 for a G7, it implies that the G7 has altered qualities. Let me explain. Look at the notes in a G7 and a Db7. What are the notes in Db7 related to G7? Db is the #11 in G7. F is the b7 in G7. Ab is the b9 in G7. B is the 3rd in G7. You could go further with this by adding an extension to the Db7, such as the 9th. The 9th in Db7 is Eb7, and what is Eb7 in the context of G7? It’s the flat 13. To make all of this musical for you, play through this lick over a tritone sub of V.
Slightly less common than the sub for V, but one you will come across from time to time is the tritone sub of the minor vi or dominant VI. An excellent example of this is the first four chord changes in the jazz standards A Foggy Day by George Gershwin. If you imagine that the A7 is the “V of ii,” meaning that you pretend the ii chord is a minor i chord, you can draw the same conclusions about the note relationships of the Eb7 and the A7. It’s the same concept. The Eb7 would imply an A7alt. For this next lick, I’m going to do something different. I’m going to combine the tritone sub of VI with the tritone sub of V. To demonstrate, the last three bars will be repeating the tritone sub of V lick we just played. I think it will be helpful for you to see both of these in action together. I’ve circled the tritone subs just to be clear about the substitute chords. The last tritone sub that I want to cover is the tritone sub of ii. Often you will see this happen in a minor ii-V-i scenario, but it can also occur in a major ii-V-I. Now, the tritone sub of ii is often used in a minor blues situation. Because it lends itself so well to the blues, this last lick is going to be a short and sweet bluesy lick. There are more possibilities with tritone substitution, but these are the main ones you will encounter. Study up on all of these, and you will have opened up a lot of different possibilities for your jazz improvisation! Have trouble trying to save thius lesson as PDF, the staffs appears as blank spaces. ¿Could you please add a "print" button? Thanks! Glad to be of help, and nice to hear you're interested in the eBook! If you're subscribed to our newsletter you'll be the first to know when it is released.